NOTE: This site is no longer being updated. Go to https://www.lwvarwc.org/ for our new website! The League of Women Voters is a multi-issue organization, whose mission is to encourage the informed and active participation of citizens in the government and to influence public policy through education and advocacy. View a presentation on the League’s history. The Washington County League provides non-partisan political information, a guide to elected officials, candidate forums, programs on current issues, and other resources to help citizens participate in the political process. Deciding to change the constitution or not is one of the most important decisions the electorate can make. Come join us for an informal discussion about ballot issue No. 1, an amendment involving civil lawsuits and the powers of the General Assembly and Supreme Court to adopt court rules. This activity will take place Wednesday August 29th at the Powerhouse Restaurant, 112 N. University Ave, Fayetteville from 5:30 to 6:30PM. Bring a friend. The University of Arkansas Cooperative Extension Center provides non-partisan explanations of the Arkansas state ballot issues. Discrimination is being recognized as the root cause of many of the nation’s social and economic problems. The League of Women Voters of the US is taking an aggressive stand to promote diversity and inclusion. Minority populations have the most difficulty being represented at the polls and in public policy decisions. In anticipation of the upcoming elections, the LWVWC is joining with the NAACP, Black Lives Matter, and the NWA Delta Sigma Theta Chapter to invite candidates to participate in a Meet the Candidate Forum: Black Voters Matter. The forum will be held on Thursday, September 6th, from 6:00 – 8:00PM at the ALLPS School of Innovation located at 2350 Old Farmington Road in Fayetteville, AR 72701. This nonpartisan forum will focus on issues of high importance to the local African – American communities in Washington and Benton counties. At this forum, candidates will have the opportunity to describe how they, once elected, will exercise the authority of their office to work for the wellbeing of communities of color. Audience participation is welcomed. The work of the League of Women Voters has special significance this election year. Expanded programs and commitments to update communications require greater support than in the past. 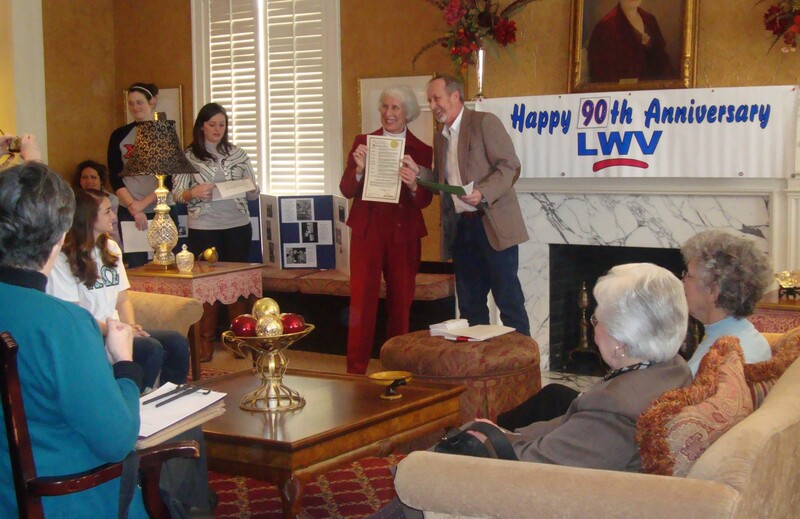 To meet local needs, LWVWC is inviting donors to attend a countdown celebration to our 100th anniversary and an opportunity to contribute to the League’s voter services. You will soon learn about a special event being planned for Wednesday, September 19, 6:00 – 8:00PM at Dromborg Castle, home of Joan and Bruce Johnson . Reservations and a minimum donation will be requested. Food and drinks will be provided along with entertainment. In preparation for larger public events in 2019 and 2020, we will feature some vignettes of prominent League leaders as entertainment. As the League of Women Voters of Washington County counts down to the organization’s 100thanniversary and 2020 celebration of the 19th Amendment, we are working hard to expand voter education and registration, improve outreach, promote minority participation in the U.S. Census and establish an independent citizens’ redistricting commission in Arkansas. Donations are critical to carry out these goals. 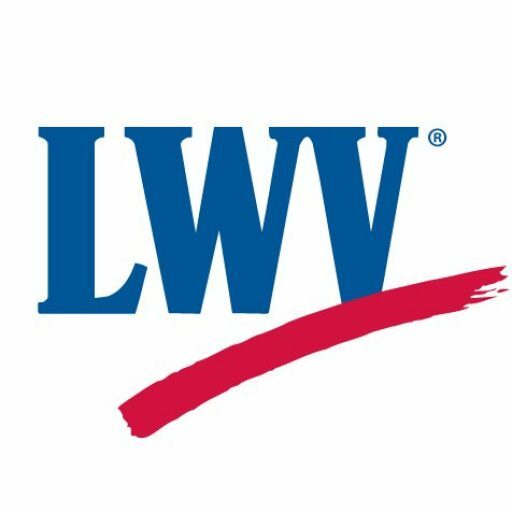 LWV Adopts Resolution on Electoral College! You are invited to honor women who have broken glass ceilings and opened doors for those that come after them. The induction ceremony will be held on Thursday, August 30, at the Statehouse Convention Center in little Rock. 2018 inductees are: Contemporary, Dr. Carolyn Frazier Blakely – Lifelong Educator, former Chancellor UA Pine Bluff; Karen Flake – President CEO Mount St. Mary Academy; Dr. Sue Griffin – Alzheimer’s Research Pioneer; Dr. Raye Jean Jordan Montague – Groundbreaking Engineer; Mary Steenburgen – Academy Award Winning Actress; Annabelle Imber Tuck – Arkansas Supreme Court Judge; Historical, Bessie Grace Boehm Moore – Created Ozark Folk Center, Educator and Civic Leader; Florence Beatrice Smith Price – Breakthrough Composer and Pianist; Group, Women’s Foundation of Arkansas – Advocate for Women and Girls. Come and hear the remarkable stories of these trailblazing women. More information, including how to purchase tickets, is here. The League of Women Voters of Arkansas proudly announces the release of the 10th edition of Government in Arkansas, an invaluable resource for teaching civics and government in Arkansas schools and as a reference for librarians, teachers, elected officials, public employees and citizens. This special edition commemorates the 100th anniversary of both the passage of the 19th Amendment to the U.S. constitution in 1920 and the creation of the League of Women Voters. Suffragist leaders formed the League following their success with the passage of the 19th Amendment to protect the right to vote for all citizens and to educate voters on how to participate in the political process. This edition features a new section on women’s suffrage in Arkansas, updates throughout, and informative comparisons of Arkansas and other states in matters of governance. To order this valuable book, see the flyer. An e-edition is coming soon. Watch this space for it. First introduced in Congress in 1878, the 19th Amendment to the U.S. Constitution giving woman the right to vote was finally passed by Congress and submitted to the states in 1919. It was adopted when ratified by three-fourths of the states in 1920. Arkansas was the 12th state to ratify in 1919. The national League of Women Voters (LWV) and the Arkansas League of Women Voters (LWVAR) were then founded in 1920. In 2020, LWV and the our League of Women Voters of Washington County will be celebrating the 100th anniversary of women’s suffrage and the 100th anniversary of the League. See the links below for more information on the history of LWV, U.S. and Arkansas suffrage, and the 19th Amendment. In Arkansas, women were given the right to vote in primaries in 1917, as explained in the two Arkansas links. To Be or Not To Be… That is the Question! of funding, hiring canvassers in a very short time and collecting the required number of verified signatures. After three rejections by Attorney General Leslie Rutledge to certify the initiative’s Popular Name and Ballot Title, those expected to provide the financial resources moved on to other projects. Suddenly under threat of legal action four measures were certified. Ballot initiatives are difficult at best to accomplish. The added financial, organizational, and time constraints facing this measure now look insurmountable. Read the AG’s decision. to collect signatures in the short time available. 2. Petitions and other required documentation must be printed and distributed. 3. 84,859 qualified signatures must be collected in required quantities in at least fifteen counties showing distribution throughout the state and not just easy to reach population centers. 4. The petition must be published in a newspaper with statewide circulation by June 6. 5. Canvassers must be trained and meet the minimum number of signatures and distribution requirements. They must be turned in to the Secretary of State for verification by July 6. 6. If the number of signatures is insufficient after verification, canvassing to make up the eficiency may continue for 30 days. 7. After the measure qualifies for the ballot, sponsors must reimburse the Secretary of State for publishing costs. The idea of a Citizens’ Redistricting Commission doesn’t have to die here. Other states are working toward action in 2020 with the hope of being ready for the 2020 Census returns in 2021. Much of the success will depend on public education and a bipartisan acceptance that the system needs change. With this education comes a better understanding of what criteria should be used when drawing district lines. Pennsylvania has formed an organization, Draw the Lines, to engage individuals, schools and colleges in a game of drawing districts. This should make the process much clearer and shine the light of an informed public on the process even if citizen-led independent commissions are not successfully established. The failure to have a ballot question on a Citizen’s Redistricting Commission is not the only way to safeguard against gerrymandering. If people who are concerned stay engaged, the public can still have an impact. If organized, a group might educate by creating its own redistricting game to serve as watch dogs if politicians continue to have control. The League of Women Voters of Arizona sponsored a redistricting game that involved citizens, schools and colleges and explained the criteria needed to draw district lines. It is still possible that with proper time and funding an Arkansas ballot initiative for a citizens’ commission could be proposed for the 2020 ballot. https://www.youtube.com/watch?v=PnfU5lIiuLY. And read the article in the Arkansas Democrat Gazette here. David Couch presented a proposed ballot initiative to improve the redistricting process in Arkansas. Here is a copy of the text of the proposed Independent Citizens’ Redistricting Commission Amendment of 2018. The League of Women Voters promotes transparent and accountable redistricting processes to end hyper-partisan practices that do not benefit constituents. The League believes responsibility for fair redistricting should be vested in an independent special commission, with membership that reflects the diversity of the unit of government. The League works in states across the country to pass ballot initiatives to institute independent redistricting commissions. Read a League Statement on Redistricting. Redistricting in Arkansas from Arkansasonline.com provides maps showing the evolution of congressional districts in Arkansas. On Thursday, November 9, the League of Women Voters of Washington County hosted a standing-room-only panel discussion and question and answer session in the Walker Room of the Fayetteville Public Library. Members of the panel were Steve Boss, PhD, Professor of Geosciences at the University of Arkansas; Nicole Clowney, Advocate for Moms Demand Action; Steven Gahagans, Chief of University of Arkansas Police Department; and Greg Leding, Arkansas House of Representatives District 86. The panel moderator was Ann Rosso. Watch the video of this important program here. Juvenile Detention Alternatives Initiative (JDAI) is an alternative to locking youth up in juvenile detention centers and is in use in Benton and Washington counties. Read about it in ‘Lock up last’ by Benjamin Hardy. This was the topic of the Jan. 17 LWVWC Drinks & Dialogue. Read about the story of Harry Burn, the east Tennessee legislator who reversed his position after receiving a letter from his mother, and his vote ratified the 19th amendment. Click here for voter registration key facts for Washington County voters. On September 27, Pat Landis, of the Pulaski County League, gave an excellent talk on League building. She recommended several valuable resources that are listed below. MLD Handbook. The MLD (Membership and Leadership Development) Program) provides many ideas for League Building. In March 2017, the Arkansas legislature enacted Act 633, which mandated a voter verification requirement similar to the one that was struck down in 2014. It will also be presented to voters in the 2018 general election as an amendment to Amendment 51 of the Arkansas Constitution. Emergency Rules For The Verification Of Voter Registration were approved on July 20 and are effective as of July 31, 2017. The Rules will, therefore, be in effect for upcoming special elections around the state. This document describes photo identification as “(1) A document or identification card that satisfies all of the following conditions: (a) Shows the name of the person to whom the document was issued; (b) Shows a photograph of the person to whom the document was issued; (c) Is issued by the United States, the State of Arkansas, or an accredited postsecondary educational institution in the State of Arkansas; and (d) If displaying an expiration date, the document or card is not expired or expired no more than four (4) years before the date of the election in which the person seeks to vote.” Consult the whole document for more information. Also in effect as of July 31, 2017, are Emergency Rules On Poll Watchers, Vote Challenges, and Provisional Voting. Additional Arkansas election rules are here. Training resources for election officials and commissioners are provided here by the Arkansas Board of Election Commissioners. A summary of Act 633 and other 2017 Arkansas election legislation is provided by the Arkansas State Board of Election Commissioners here. New Voter ID requirements per Act 633 explained by the Washington County Election Commission are here. On October 15, 2014, the Arkansas Supreme Court unanimously struck down the Voter ID Act 595 of 2013. Read the decision here. Two specialized federal election-related commissions have been in the news recently. They are linked from the Election links section on LWVWC Links page. The U.S. Election Assistance Commission (EAC) “was established by the Help America Vote Act of 2002 (HAVA). EAC is an independent, bipartisan commission charged with developing guidance to meet HAVA requirements, adopting voluntary voting system guidelines, and serving as a national clearinghouse of information on election administration. EAC also accredits testing laboratories and certifies voting systems, as well as audits the use of HAVA funds.” News reports have indicated that this important commission may be abolished. The Presidential Advisory Commission on Election Integrity was established in May by executive order of the President to study the registration and voting processes used in federal elections. Concern has been reported in the news that the commission’s work might lead to vote suppression. Lifelong Housing: Homes for All Ages, a public panel, was presented on Thursday, February 16, 2017. Sponsors were the League of Women Voters of Washington County, Age-Friendly Fayetteville, City of Fayetteville, and AARP Arkansas. Program materials, including a video of the program, panelists’ presentations, and useful internet resources are here. Nancy Kahanek, a member of the Judicial Equality for Mental Illness Task Force (JEMI) and a League member has written a very informative column Treat, Don’t Jail, the Mentally Ill in the August 20, 2015, Arkansas Times. Read the article here. “Mental Illness and the Judicial System” was the topic for the April 16, 2015, program sponsored by the League of Women Voters of Washington County, Mental Health America in Northwest Arkansas and the Judicial Equality for Mental Illness Task Force (JEMI). Laura Kellams, NWA Director for Arkansas Advocates for Children and Families and LWVWC board member, has written Falling Behind: State Loses Ground on the Education of Its Children. Learn where Arkansas stands on the funding of its Arkansas Better Chance program. Read the column published August 7, 2015, in the Northwest Arkansas Democrat-Gazette. The American Voting Experience: Report and Recommendations of the Presidential Commission on Election Administration was released on January 22, 2014. Because many voters in the 2012 election experienced long lines and waits of many hours, President Obama appointed a ten-member Commission to study and provide recommendations on improving the voter experience. Co-chairs of the Commission were the chief counsels to the 2012 Obama and Romney campaigns. The report and recommendations, which included ways to shorten waiting, expand early voting, and improve technology, were presented to the President after a six-month investigation. Read the report and the news release. Resources for learning more about this important issue and the national LWV’s stand on it include the LWVUS position, an LWVUS press release, videos and additional information, and an article from The Hill’s Congress Blog. View the League’s excellent programs on shale economics (October 2013), watersheds (September 2013), immigration law (April 2013), the Common Core Education Standards (January 2013), and cyberbullying (October 2012) on the Internet. Former legislator Lindsley Smith has produced a fascinating video on the history of women in the Arkansas General Assembly 1922-2012. This work was supported by the University of Arkansas Women’s Giving Circle and the Diane D. Blair Center of Southern Politics and Society. 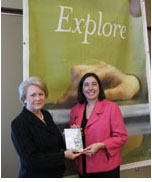 Interact with the League of Women Voters of Washington County on Facebook at http://www.facebook.com/lwvwc/!!! LWVWC Lifelong Housing Resources prepared for the February 2017 meeting. Updated 9/2017. LWVWC Mental Illness and the Judicial System Resources prepared for the April 2014 meeting. Updated 8/2015. to check your voter registration. center, which opened in 1971. She managed that center and encouraged the local, Arkansas, and national Leagues’ interest and advocacy in recycling. Mayor Lioneld Jordan, LWVWC President Mary Alice Serafini, and Waste Reduction Coordinator Brian Pugh were speakers. Read Mary Alice’s remarks about Marion here. See more photos on Flickr. 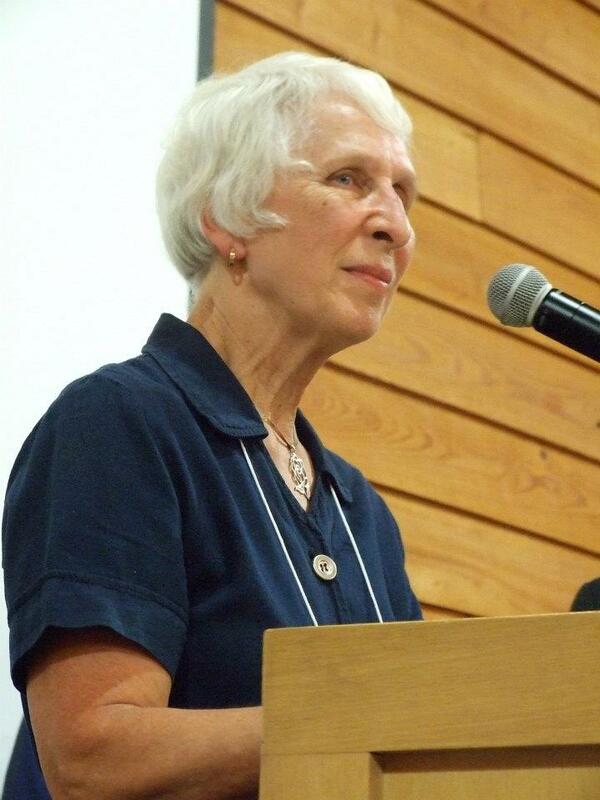 The Arkansas Citizens First Congress and Arkansas Public Policy Panel honored Joyce Hale, former President of the League of Voters of Washington County, with the Brownie Ledbetter Dragon Slayer Award on June 23 at the 4H Center in Little Rock. She was honored for working tirelessly through the League of Women Voters, Sierra Club, and other groups to champion a range of issues from fair elections to clean water to make Arkansas a better place. “She was one of the first, and most forceful, in the state to raise concerns about the impacts of natural gas fracking on water quality and landowners.” Congratulations to Joyce Hale on this richly-deserved honor! Five women who have made significant contributions to Washington County will be honored at the Women’s History Month Banquet at the Clarion Inn on March 26 at 6:00. 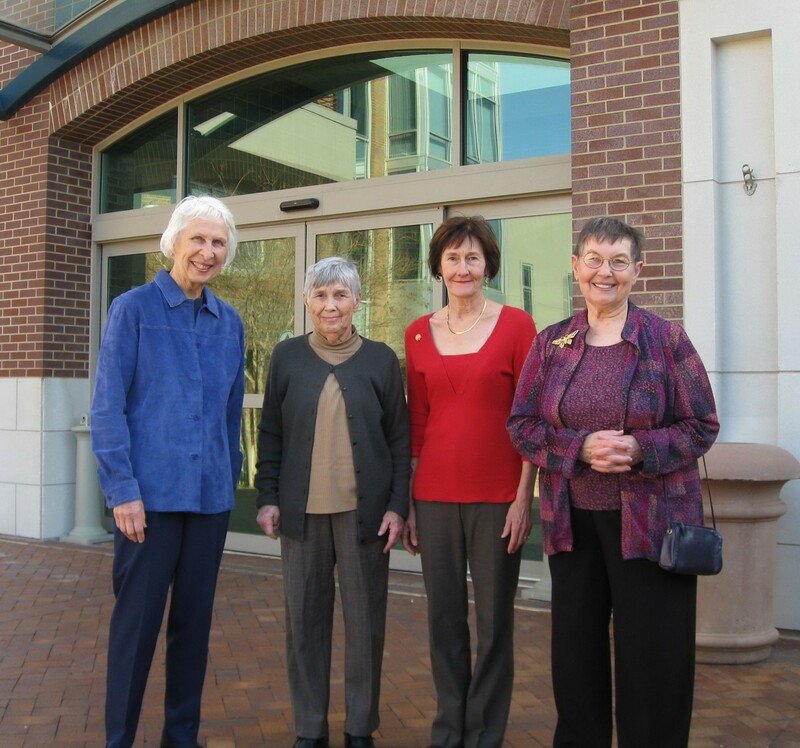 Congratulations to League of Women Voters of Washington County Second Vice President (and former President) Joyce Hale, to League members Senator Sue Madison, Jane Scroggs, and Bobbie Nell Templeton, and to Lib Horn! 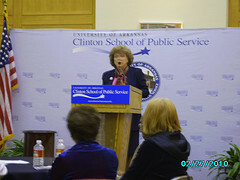 On March 1, Mary Wilson, President of the League of Women Voters of the United States spoke at the Clinton School of Public Service on “2010: A Year of Celebration and Climate Concerns,” about the League’s 90th anniversary and its efforts to promote public policy responding to the effects of climate change. Video of speech. Photo gallery. News story. 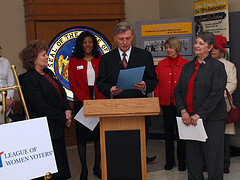 …I, Lioneld Jordan, Mayor of the City of Fayetteville, Arkansas do hereby proclaim Saturday, February 13, 2010 as “LWV MAKING DEMOCRACY WORK DAY” in Fayetteville, Arkansas in honor of the League of Women Voters’ 90th Anniversary and urge all residents of Fayetteville to pay tribute and respect to the League of Women Voters for all they do to make our community healthy, vibrant and strong. The ceremony was hosted by the Chi Omega Sorority at the University of Arkansas, where a Chi Omega member read a speech given by Little Rock suffragette, Florence Cotnam, to the first LWV Convention in Chicago on Feb. 14, 1920. Ratification of the Nineteenth Amendment granting women the right to vote was completed on August 18, 1920. More photos at Flickr. J.P. Peters of the League of Women Voters of Washington County presents Fayetteville Public Library Director Shawna Thorup with the DVD, “A Sense of Wonder,” the story of Rachel Carson, whose 1962 book, Silent Spring, helped launch the environmental movement. Filmed at Ms. Carson’s cabin in Maine, the documentary focuses on the last year of her life. As she struggles with cancer and with the critical attacks from the chemical industry, the government, and the press, she uses her remaining energy to spread her message to the American people and to Congress. Supplemental materials include discussion of Carson’s legacy by leading environmentalists, a visit with former Interior Secretary, Stewart Udall, and interviews with Carson’s adopted son, Roger, and with actress/producer, Kaiulani Lee. Genie Donovan and Wanda Stephens were inducted into the League of Women Voters of Arkansas Hall of Fame on Saturday, April 25, at the LWVAR Convention in Fayetteville. 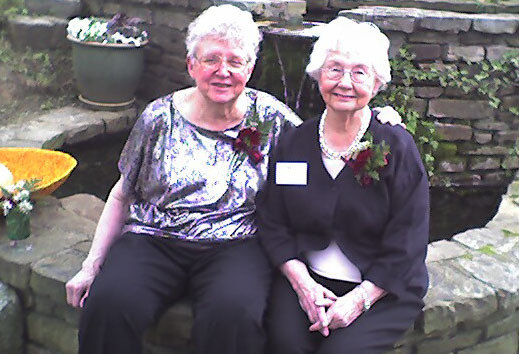 Both have served as president of the League of Women Voters of Washington County, and both have made numerous other contributions to the local League and to the community. Donovan currently serves on the LWVWC Board as Voter editor. Five women from the community were honored at the 11th annual Washington County Women’s History Month Banquet at the Clarion Inn, Monday, March 23. Honorees include League President and longtime mental-health advocate Elizabeth “Libby” Wheeler and and Bettie Lu Lancaster, League Voter Services Chair and League Board member, whose many other contributions to the community include starting a library for women in the county jail. Also honored were Patsy Brewer, Edith Hawkins, and Gail Segers. After LWVAR studied the use of tax incentives for land preservation, hosted a conservation easement forum, and advocated passage of HB1577, a new water protection program became law without a single vote of opposition. Landowners may now receive state tax credits for conservation easements protecting their riparian zones and wetlands. 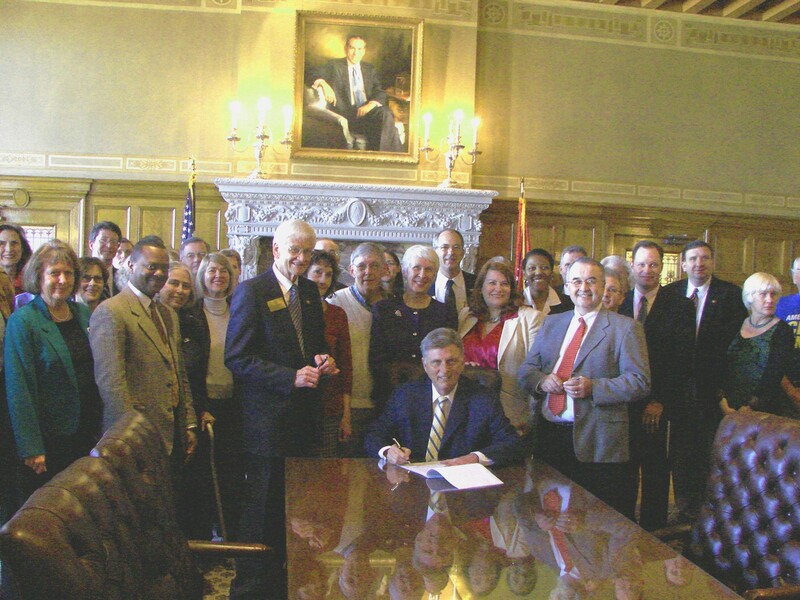 Governor Beebe signs the bill which now becomes Act 351. Bill sponsors, League members, state agency personnel, and conservation organizations were in attendance at the Capitol for the signing ceremony on March 16, 2009.